Jonny Lee Miller currently stars as Sherlock Holmes in Elementary, CBS’s modern-day, New York-set adaptation of Sir Arthur Conan Doyle’s stories. Miller first gained international attention with his performance as Sick Boy in Danny Boyle’s Trainspotting. Miller reunited with Boyle for London National Theaters’s production of Frankenstein. Miller won an Olivier and Evening Standard Award for his performance, shared with Benedict Cumberbatch, with whom he alternated in the role of Victor Frankenstein and the Creature. In 2013, Miller ran two 50-mile ultramarathons in support of Jonah’s Just Begun. Miller Raised over $220,000 dollars to date to fund a two-year research program to raise funds to treat Sanfilippo Syndrome. Kristine Johnson currently co-anchors the 5 p.m. & 11 p.m. news at the CBS owned and operated station in New York City. She joined CBS 2 in the fall of 2006. Since then, she has been nominated for several Emmy Awards and had the honor of winning several trophies. CBS has called upon Kristine to guest co-host the daytime talk show “The Talk” from time to time. She also played the role of a news anchor (a real stretch!) on episodes of the CBS hit primetime shows “Person of Interest” and “Elementary”. 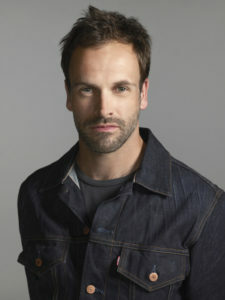 In February of 2014, Kristine conducted an interview with Jonny Lee Miller about his involvement with Jonah’s Just Begun. Like Jonny, Kristine was moved by the story and wanted to help too. Kristine is now part of the team, helping to promote JJB and bring awareness to Sanfilippo Syndrome.